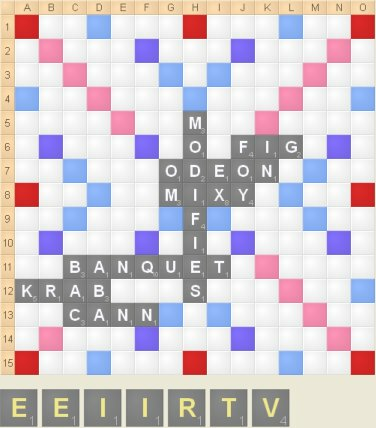 Free Scrabble Word Finder. Don't Worry - I Won't Tell. 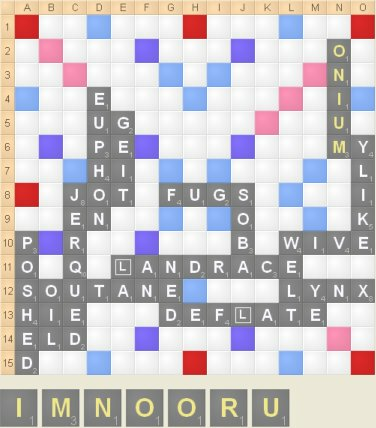 Here is a regular Scrabble Word Finder Challenge to warm you up before we get into some detailed lessons about how to score well in Scrabble. 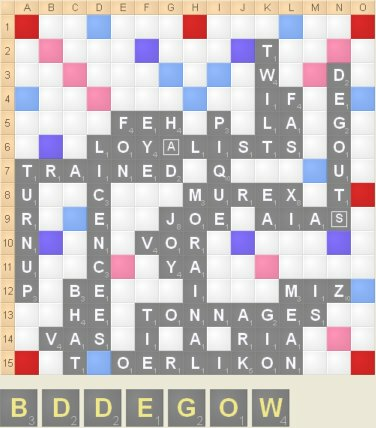 I will present you with a Scrabble board and a rack. Your job is to find the highest possible score playable in this game position. Remember, you are not necessarily chasing the best strategic move here. Like a golfer practices putting, you are here to practice scoring. In case you're wondering, a BEKAH is a half a shekel. 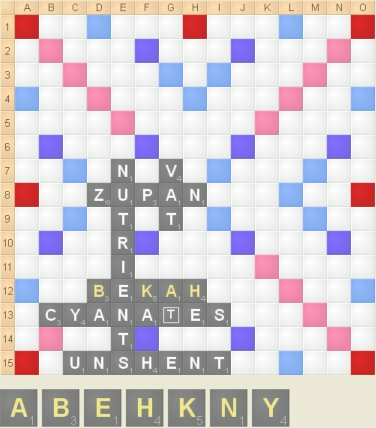 If you like these kinds of puzzles, or if you just enjoy browsing interesting articles about words and word games occasionally, you might enjoy my free Word-Buff Stuff! newsletter. 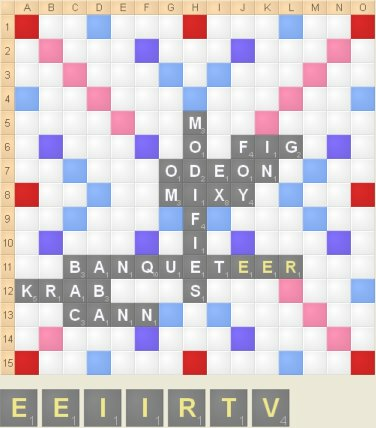 The Scrabble Word Finder Challenge helps you develop the most important skill in a Scrabble game: the ability to find high scores. That doesn't mean you will always take the highest score on offer, though. You will often need to sacrifice points for strategic reasons. 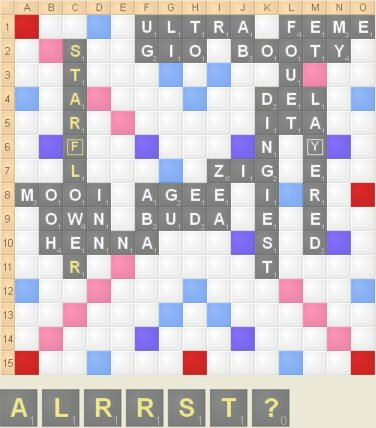 However, at the end of the day, the winner is the person who has scored the most points, and if you are mediocre at spotting high scores, you will play mediocre Scrabble. So let's focus on scoring now, and later we can address the subtleties of what we'll call rack-management. Instead of rambling on and on, I'm going to do this by showing you lots of examples of typical situations that arise in a Scrabble game. I've chosen each example to illustrate a particular type of scoring opportunity you will need to learn to recognize and master. You can think of the regular challenge at the top of this page as a way of putting it all together. 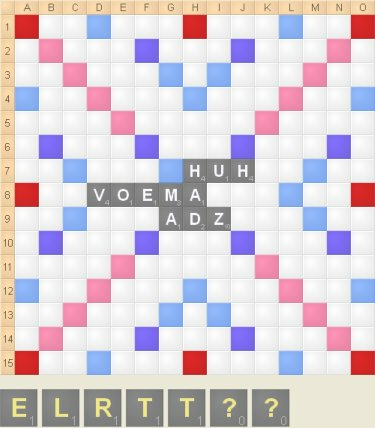 You'll have plenty of practice puzzles below as well, but in these puzzles you kind of cheat a little, because you can tell from the subtitle what kind of hot-spot you're looking for. Double-crossing a tile means playing it so that its score is counted in two directions (across and down). Double-crossing is a great way to leverage premium squares, because a high-scoring tile can be leveraged for 40 or even 60 points when it is doubled or tripled in each direction! 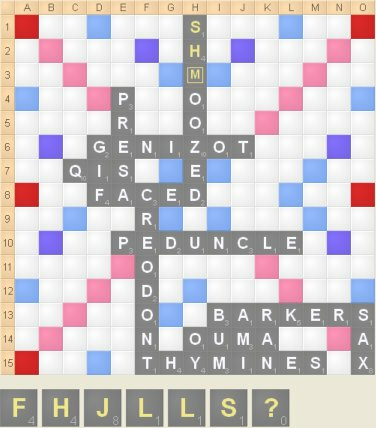 In fact, you can often even turn mid-scoring tiles like H, F, and Y into easy 30+ point plays by scouring the board for double-crossing opportunities. 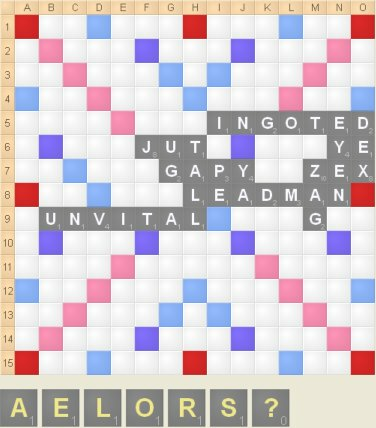 Here's an example of how a Z and an X can convert into 72 points using a simple double-crossing play. By overlapping I mean placing your word parallel to an existing word in such a way that one or more perpendicular words are formed. 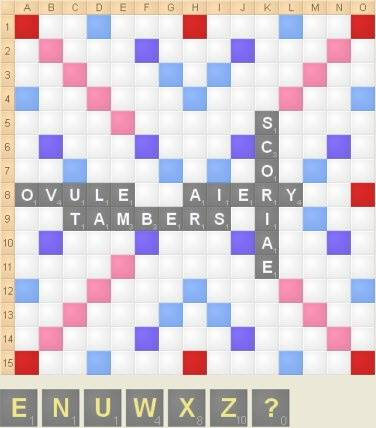 Since each overlapping tile results in a new word being formed, your score increases with each overlap. Since overlapping usually results in the formation of two and three letter words, you'll need to know these thoroughly in order to spot overlapping opportunities. In the following situation, there are plenty of bingos on offer, but the highest scoring bingo requires you to make as many overlaps as possible. See how you fare before scrolling down to the answer. In the example you just saw, the extra overlaps only score a handful of extra points. 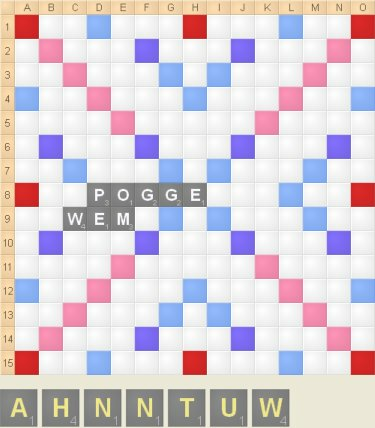 Keep in mind though, that if you can find five more points on each move of a game, you'll add 60+ points to your final score, and that will certainly make a difference to your win-rate! In the next example, find the highest scoring play by paying particular attention to overlap opportunities. Did you find the 50-point play? 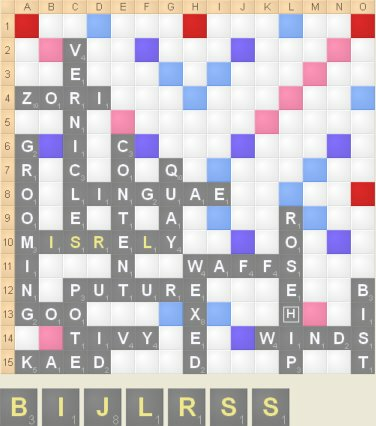 The double-double is a rarity in lounge-room Scrabble, and is even under-utilized on the Scrabble tournament scene. 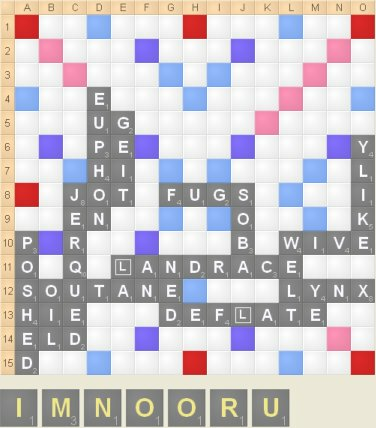 Now, I realize that you know that placing your word so that it covers a pink square results in doubling the score for that word, but did you realize that it is sometimes possible to cover two double-word squares simultaneously? 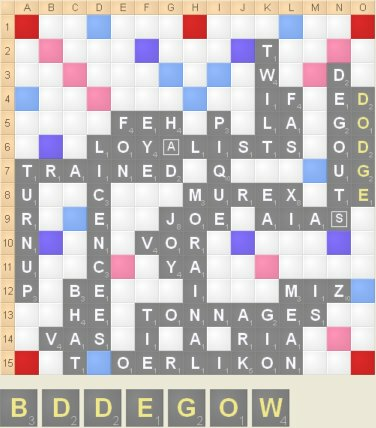 And when you do this, you score four times the value of the word. 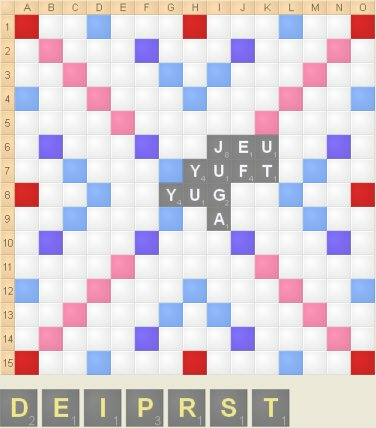 Of course, if you use up all seven tiles in the process (which often happens since a double-double must be at least seven-letters long), you get the usual 50 bonus points as well. 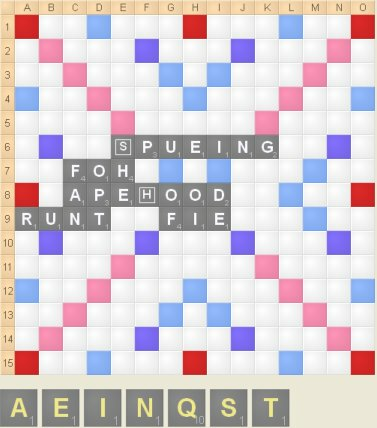 Ok. To find this one, you'll need use the fact that HUHU is a valid Scrabble word. In case you're interested, it's a type of New Zealand beatle. 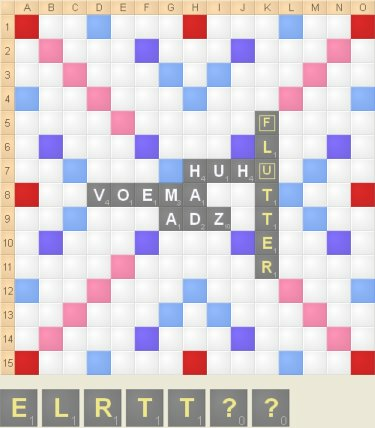 You could also have CLUTTER in the same position, but FLUTTER is slightly more interesting since it allows me to mention the possibility of a front hook play of A-FLUTTER later in the game. 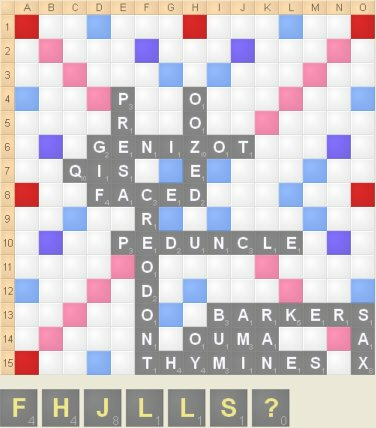 Note also that there are a number of solutions through the O, like RETOTALS and TRIOLETS, but we are focusing on this page on finding the highest-scoring play. 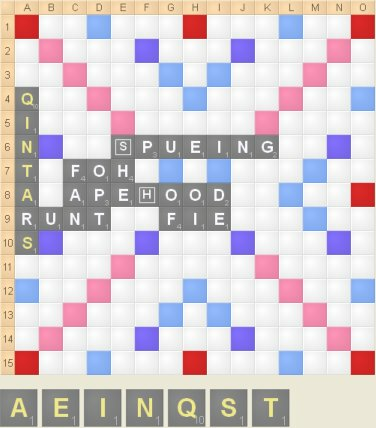 Hooking onto HUH gives us a handy extra nine points that the O-floater lacks. Double-doubles are especially likely when you have a blank on your rack, because of the extra flexibility the blanks provide. 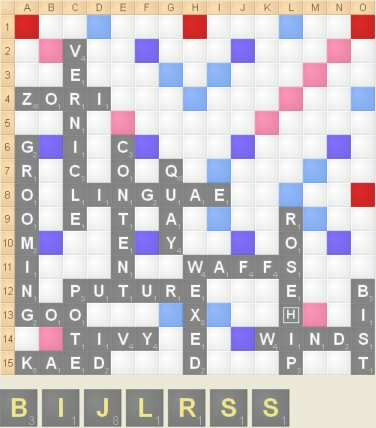 If you have two blanks on your rack, as in this example, you should definitely scrutinize the board for double-double opportunities. Here's the solution, which allows you to score 48 points for that mediocre-looking rack!